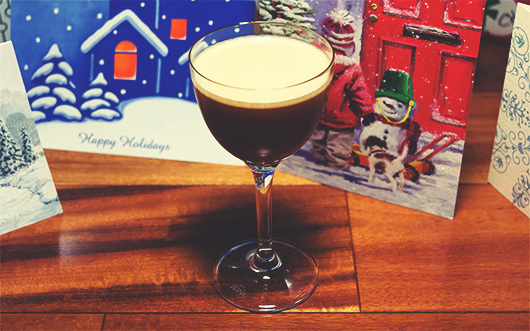 Three delicious libations with the flavors of the holidays. The holidays are here, which for most Americans means long nights and cold weather. It also means eating (too many) sweets that use festive flavors like peppermint, ginger, cinnamon, nutmeg, and clove. What better accompaniment to these and other holiday treats than a trio of easy to make, easy to drink cocktails featuring similar scents and flavors? As usual with these articles, the goal is to use mainly easy-to-find ingredients (preferably stuff people already have at home), but you might need to hit the local liquor store for a few items. I’ve picked a warm drink to accompany two chilled entries, and have avoided cream-based cocktails because I think they’re too heavy when paired with holiday desserts. I should note though, that the Candy Cane cocktail becomes much more decadent and dessert-y with half an ounce of light cream added to it. The invention of this drink is attributed to Col. Francis Negus, likely in the early Eighteenth Century. It’s a cocktail of wine combined with warm water and sugar, to which other flavors can be added. Lemon and nutmeg are common additions, and you’ll find them here, but I’ve also added a hearty dose of Angostura bitters to bring in clove and other spices, along with my special secret: half a shot of spiced rum. If you don’t have or want to buy port, you can sub in an extra ounce of red wine and another quarter ounce of simple syrup. Make sure to use a decent red wine. Doesn’t have to be fabulous – but if you wouldn’t drink it straight, you shouldn’t mix with it either. Combine all ingredients except water in a large mug and stir to combine. Add hot water slowly, stirring, until the mug is full. Garnish with a dusting of fresh grated nutmeg and an orange twist. 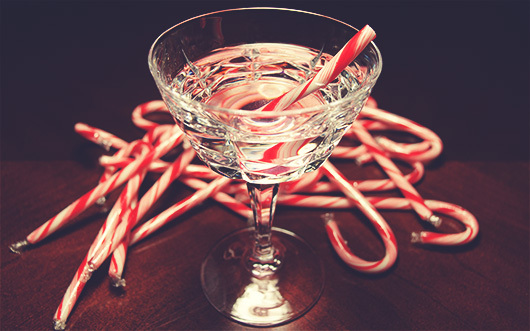 There are a million different recipes for Candy Cane cocktails available on the web, ranging from ones that are relatively decent, to ones that are absolutely execrable. I’ve tried to err more on the side of producing something where the mint liqueur acts as an accent, rather than becoming utterly cloying. This drink as recommended is crisp and clear, with lots of holiday flavor. If you decide to add the cream to this recipe, you might also want to add a quarter ounce of simple syrup, depending on how sweet you like your drinks. Combine all ingredients in a pint glass over ice and stir thoroughly (if you added cream, use a cocktail shaker instead). Strain into a chilled cocktail coupe. Garnish with a miniature candy cane. We like ginger here at Chez Buecheler, and it finds its way into a lot of our cooking. 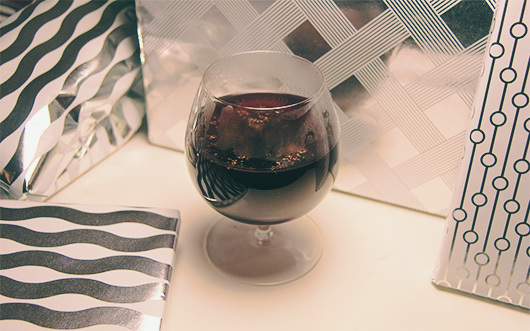 It also periodically shows up in a cocktail, which is great, especially when combined with the warm caramel notes of bourbon, and the holiday spiciness of Amaro Averna (which is also delicious sipped on its own). If you can’t find Averna, there are many other Italian amari worth trying, all of which have their own flavor profile but tend toward the warm-spice side of things, and should work in this cocktail. Ramazzotti and Nonino are two other common brands. If you don’t want to go through the trouble of muddling fresh ginger, you could add half an ounce of ginger liqueur instead. I like the fresh stuff, though – it has a lot more bite! Just be careful. You only need a very small amount to get a whole lot of ginger flavor into the drink. Muddle the chopped ginger with the bitters and Averna in the bottom of a cocktail shaker. Add bourbon, apple cider, and ice, and shake thoroughly. 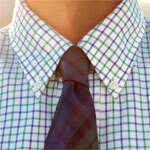 Double-strain into a chilled, ice-filled rocks glass. No garnish.